Were Hedge Funds Right About Dumping Archer Daniels Midland Company (ADM)? IArcher Daniels Midland Company (NYSE:ADM) has experienced a decrease in hedge fund sentiment in recent months. ADM was in 29 hedge funds’ portfolios at the end of the fourth quarter of 2018. 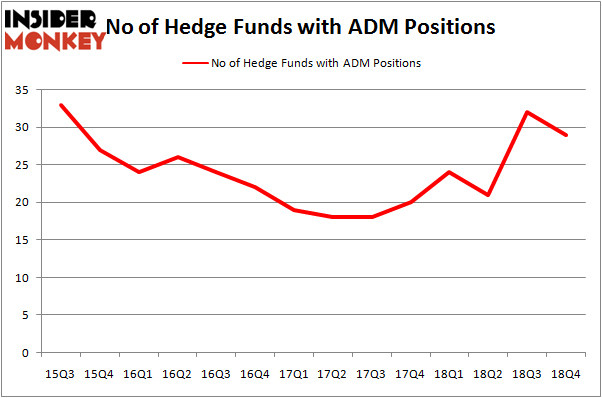 There were 32 hedge funds in our database with ADM positions at the end of the previous quarter. Our calculations also showed that ADM isn’t among the 30 most popular stocks among hedge funds. We’re going to view the fresh hedge fund action encompassing Archer Daniels Midland Company (NYSE:ADM). At Q4’s end, a total of 29 of the hedge funds tracked by Insider Monkey were bullish on this stock, a change of -9% from the previous quarter. By comparison, 24 hedge funds held shares or bullish call options in ADM a year ago. With hedgies’ capital changing hands, there exists an “upper tier” of noteworthy hedge fund managers who were increasing their holdings substantially (or already accumulated large positions). Among these funds, AQR Capital Management held the most valuable stake in Archer Daniels Midland Company (NYSE:ADM), which was worth $133.6 million at the end of the third quarter. On the second spot was Millennium Management which amassed $105.1 million worth of shares. 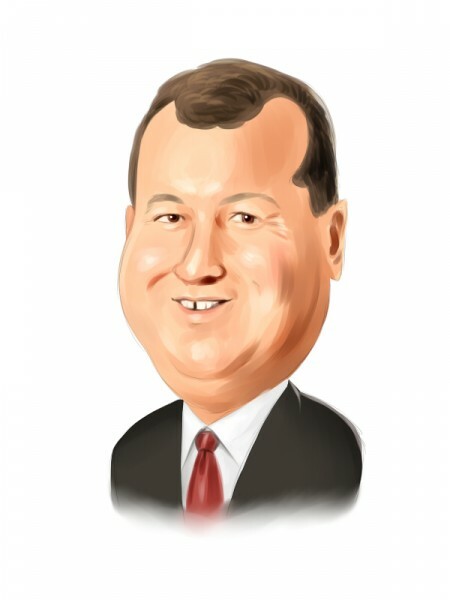 Moreover, Markel Gayner Asset Management, Renaissance Technologies, and Two Sigma Advisors were also bullish on Archer Daniels Midland Company (NYSE:ADM), allocating a large percentage of their portfolios to this stock. Seeing as Archer Daniels Midland Company (NYSE:ADM) has faced bearish sentiment from the smart money, we can see that there is a sect of fund managers that slashed their entire stakes in the third quarter. It’s worth mentioning that Dmitry Balyasny’s Balyasny Asset Management cut the largest position of all the hedgies followed by Insider Monkey, totaling about $20.4 million in stock, and Steve Cohen’s Point72 Asset Management was right behind this move, as the fund said goodbye to about $18 million worth. These transactions are intriguing to say the least, as total hedge fund interest fell by 3 funds in the third quarter. Let’s also examine hedge fund activity in other stocks – not necessarily in the same industry as Archer Daniels Midland Company (NYSE:ADM) but similarly valued. We will take a look at Hormel Foods Corporation (NYSE:HRL), United Continental Holdings Inc (NASDAQ:UAL), SunTrust Banks, Inc. (NYSE:STI), and Brown-Forman Corporation (NYSE:BF). This group of stocks’ market caps match ADM’s market cap. As you can see these stocks had an average of 30.5 hedge funds with bullish positions and the average amount invested in these stocks was $2021 million. That figure was $605 million in ADM’s case. United Continental Holdings Inc (NASDAQ:UAL) is the most popular stock in this table. On the other hand Hormel Foods Corporation (NYSE:HRL) is the least popular one with only 18 bullish hedge fund positions. Archer Daniels Midland Company (NYSE:ADM) is not the least popular stock in this group but hedge fund interest is still below average. This is a slightly negative signal and we’d rather spend our time researching stocks that hedge funds are piling on. Our calculations showed that top 15 most popular stocks among hedge funds returned 19.7% through March 15th and outperformed the S&P 500 ETF (SPY) by 6.6 percentage points. Unfortunately ADM wasn’t in this group. Hedge funds that bet on ADM were disappointed as the stock returned 6.3% and underperformed the market. If you are interested in investing in large cap stocks, you should check out the top 15 hedge fund stocks as 13 of these outperformed the market.